Living Like a Local: How Do I Get an Alipay Account? 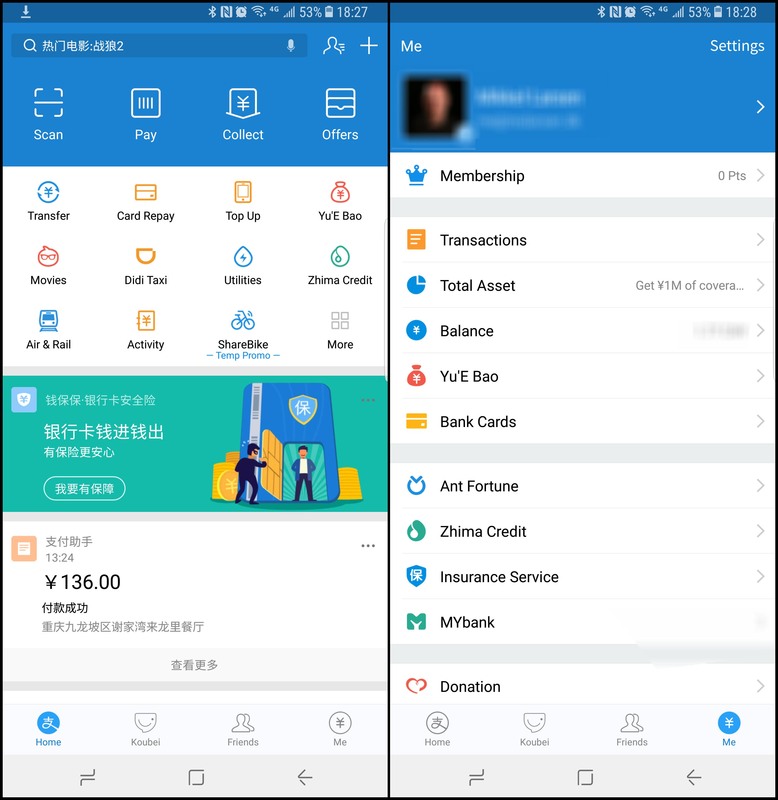 Alipay or 支付宝 (ZhiFuBao) is an excellent example of one of those apps in China that just make life so much more convenient. I am from Denmark, and we consider ourselves pretty tech savvy, but China really has it nailed when it comes to convenience and going cashless. I rarely have to pay cash anymore, as I can pay anything from utilities to groceries a flight, or train tickets directly using my phone. On top of this, Alipay is safe, and transactions are insured against fraud! Also, the app is in English! Bonus! Pay utilities for your apartment, such as Water, Gas, Electricity, and Internet Services. Shop on almost all Chinese websites like TaoBao and JingDong. Pay in stores, bars, and restaurants, even most street vendors. To set up an Alipay account, you will need to have your passport handy, along with your Chinese Phone number and your Chinese Bank Card. I will go through the process of setting up an Alipay account on my Android phone, but the process is the same on an iPhone with iOS. The first thing you need is to downloads the app on your phone. You can download the app from the Google Play Store (using a VPN) or any other App Store you have access to. I will be looking through the App Store on my phone. When you open Alipay for the first time, you’ll be asked to log in or Sign up. 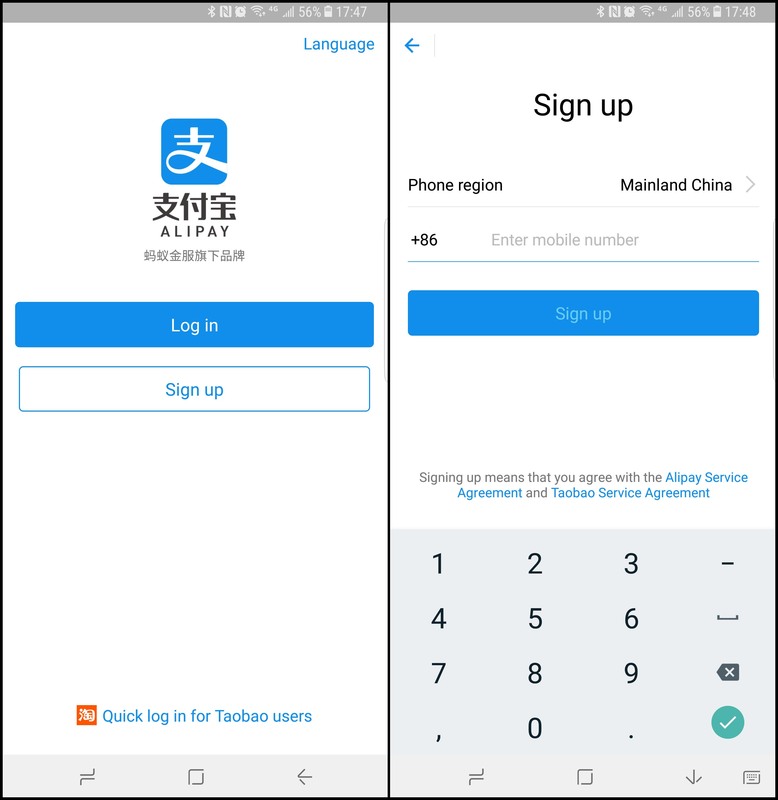 Select Sign up and use your Chinese mobile phone number to create your account. Alipay will verify your phone number and send you a 4-digit confirmation code that you need to enter. You will also be asked to choose a login password for Alipay. In the future, you can login using your phone number and this password. While adding your bank card isn’t strictly necessary to use Alipay, it is definitely the best way to go. You could ask a friend to transfer money into our Alipay account, but linking your bank card means you can top up your balance by yourself or pay with your card directly. 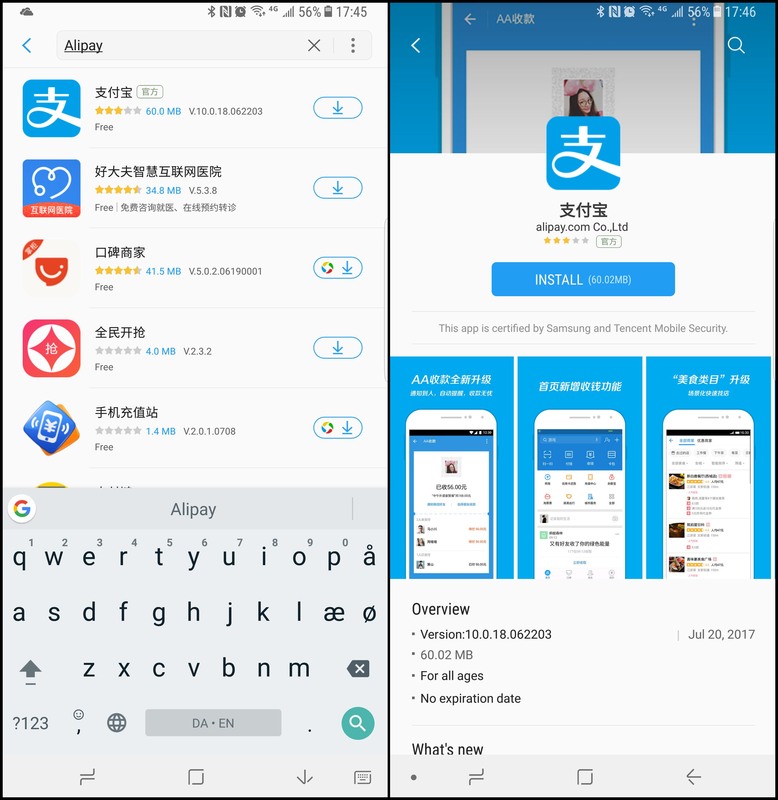 When you open up Alipay you will be taken to the front page where you can see some of the most used mini apps. More – There are many more uses for Alipay. You can also see a snippet that says I spent ¥136.00 so I can easily keep track of the money I spent through Alipay. After clicking the Me button in the lower-right corner you will be taken to the account management screen. Here you can check your balance, fill out your information and more importantly add your bank cards. Note: Due to the standard naming convention used in China, I highly recommend that when you have your bank card opened, that you enter your name in ALL CAPS and in the order “LAST NAME” “FIRST NAME” “MIDDLE NAME”. For example, my name is Mikkel Stig Larsen, but my bank card will say LARSEN MIKKEL STIG. This is how they will enter your name off of your passport, so if your name in your bank account has a different order, you might not be able to link your card! Here I have clicked the “Bank Cards” option and clicked the plus icon in the top corner to come to the first screen below. Start by entering your bank card number (the one printed on the card). Alipay will already know which bank you are using. (Alipay might ask you to create a 6-digit payment password before you can add a bank card. It may also ask you to create this password later, after adding the card). Depending on the kind of card you are adding, Credit card or Debit Card, it may ask for different information but you will always need to confirm your name, ID Type (usually passport) and your passport number as well as the Chinese phone number you used to open your bank card with. 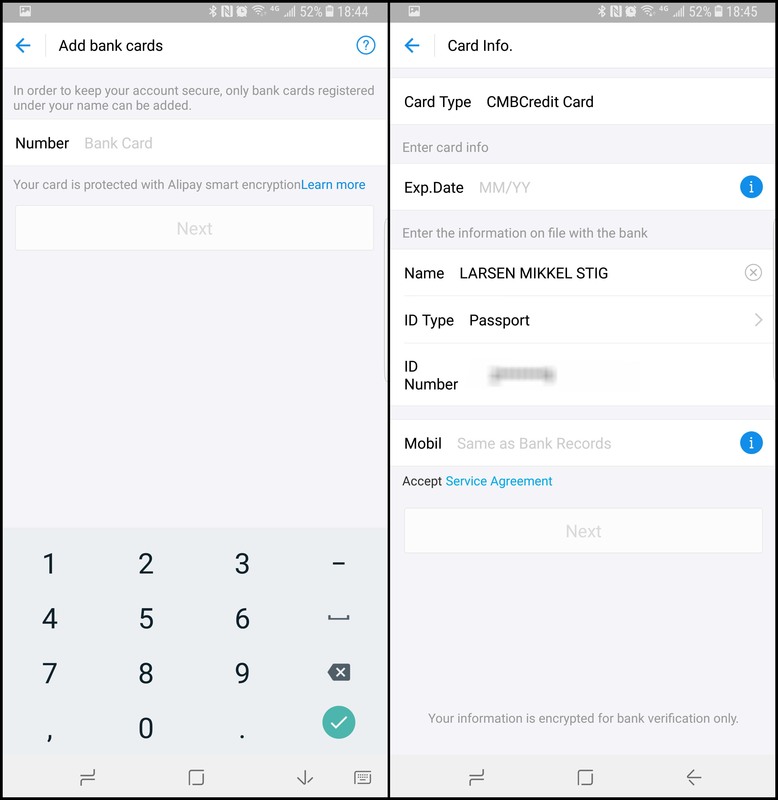 Note: In order to use your bank card through a phone app like Alipay you have to request the feature when you open the card or you can go to the bank and request it be opened. You will receive another verification SMS message on your phone for linking your bank card to Alipay, once you have entered the text, you should be good to go. If you are unable to link your bank card, it could be because of how your name is written on your Bank Card. When I first opened my bank card, they wrote my name as MIKKEL STIG LARSEN which is correct, but it doesn’t work when linking the bank card. Now that you have your Alipay account set up and you have your bank card linked, you can start topping up your account, shopping on Chinese websites or paying at restaurants and shops. On the main screen, you’ll see 4 big icons on a blue background. Scan – lets you scan a shop or a person’s QR code and transfer an amount to them. Street vendors, Taxi drivers, and some stores prefer this method. You will see a QR code with an Alipay logo on it, just scan it and transfer the amount you have to pay. Pay – opens up a QR code that a seller will scan on your phone. Typically bigger stores and supermarkets use this. When they scan your QR code they automatically withdraw money from your account. Collect – lets you receive money from others. Offers – will have offers like discounts and coupons for you to use. Note: When you are paying shops and sellers, make sure to choose which “wallet” you are using to pay with. Using your “balance” means paying with the money that is in your Alipay wallet. Paying with one of your linked cards is the same as physically taking out your bank card and paying with it. Regardless of the method you use, you will have to enter the 6-digit payment password you created when you added your card! Congratulations, you are well on your way to Living like a Local in China! This article was an amazing read! I learned so much from it and I feel like i can operate much better in China! Awesome! There will be more China “hacks” on the way – stay tuned!